As promised, we’re back with part 2 of our coverage of the Supreme Court’s surprising decision to take on yet another Obamacare case. Last time, we pointed out that the announcement means four of the nine justices are at least considering ruling that would eliminate subsidies to help pay for insurance in states that run their own exchanges. That doesn’t mean they will, but it’s worth looking at what can be done if the Court does make coverage unaffordable for nearly five million Americans. Luckily, not only are relatively easy fixes available at both the state and national level, but Republicans might actually be willing to join Democrats in passing them. Ever heard the line “no plan survives first contact with the enemy?” Well, no big law ever fully survives first contact with reality. There are always provisions that prove poorly drafted, or parts that don’t elicit quite the behavior you expected. Then there are the parts that work better than you expected, and which you want to expand. Medicare was signed into law in 1965. In 1967, Congress passed a bill making a suite of technical changes and modest reforms to the new program. They did the same in 1972. The 1986 immigration bill was corrected in 1988. Social Security was altered in 1939, and has been changed time and again in the intervening years. Medicare Part D’s difficult implementation process led to Democrats calling hearings to gather ideas on how to fix it. This is how it should be. Laws are written on paper, not stone. They can be easily changed. The current lawsuit could be shut down tomorrow if Congress simply passed a technical corrections bill clarifying that, yes, subsidies should be available on every exchange. However the strategy only works if Republicans can (1) keep the focus off individual provisions of the law, which are very popular; and (2) avoid questions about what would happen to the millions of people who would lose coverage if Obamacare were repealed. If five million people lost subsidies thanks to the Supreme Court striking the subsidies, suddenly the focus would be on a very popular provision, and the GOP would have to explain why it’s standing in the way of affordable coverage for so many people. Even if Congress didn’t pass a technical fix, states whose residents lost subsidies could regain them by creating their own exchanges. This is easier than it sounds because it does not mean that these states would have to build their own websites from scratch. A state could, for example, establish an exchange and appoint a state-incorporated entity to oversee and manage it. That state-incorporated entity could then contract with Healthcare.gov to operate the exchange. On the ground, nothing would change. But tax credits would be available where they weren’t before. I don’t see any legal obstacle to that approach. Charles Gaba, who’s been counting how many people have enrolled through Obamacare exchanges at ACASignups.net, calls this the “Denny’s Grand Slam Solution” because pretty much all a state would really have to do is register a domain name for an exchange and point it towards healthcare.gov. Registering a domain name costs about $10– the price of a Grand Slam breakfast at Denny’s (including a tip). The question then is how many states would actually opt to set up an Obamacare exchange, even if it cost almost nothing. After all, a couple dozen states refused to expand Medicaid for free, simply because it was part of Obamacare. But it turns out, many of those same states take a different view of the subsidies. Last Monday, 18 state attorney generals filed an amicus brief siding with the government, saying that their states assumed that subsidies would be available on federally-run exchanges. (Part of the argument against the subsidies is that Congress intended to deny subsidies to incentivize states to create their own exchanges– if that were true, these states didn’t get the memo.) A bunch of states that signed on, like Virginia, Maine, North Carolina, and Mississippi, had turned down the Medicaid expansion after the last Supreme Court decision. I think millions of people will be immediately uninsured. I think this will hurt the private insurance companies in those states. I think it will hurt the hospitals in those states. I think it will hurt doctors, and medical device companies, and pharmaceutical companies, and many, many health care workers in those states. […] I think those interests have a voice, though, and they’ll use it. If the Court’s reading of the subsidy scheme renders the statute unconstitutionally coercive or injurious, then, per U.S. v Booker, the Court should ask “what ‘Congress would have intended’ in light of the Court’s constitutional holding.” And in so doing, Roberts et al would probably have to make the establishment of an exchange optional, with no penalty for using the federal fallback, just like they did when they made the Medicaid expansion optional. Along similar lines, Roberts could find for the government by invoking the principle that the Court ought to interpret the statute in a plainly constitutional way, rather than trespass into difficult constitutional questions. All of this is to say that an adverse ruling wouldn’t be the end of Obamacare– and it may not even be the end of the subsidies the plaintiffs are suing to eliminate. 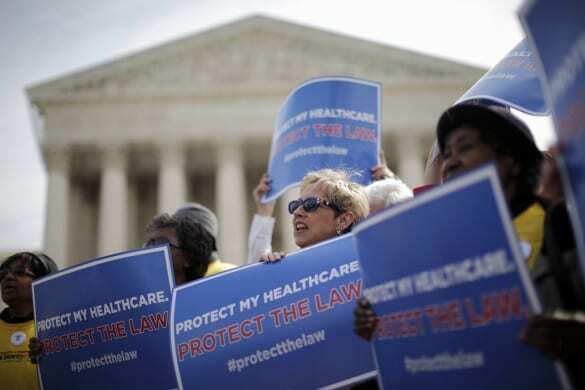 UPDATE 12/1/14: USA Today has a good counterpoint to this post, titled “Experts: No easy options if court strikes down ACA.” It makes some good points that (1) a ruling eliminating the subsidies would be terrible (2) there are some practical and political considerations that could keep states from establishing their own exchanges in response. However, it also ignores the intense political pressure that Congress and states will face to re-establish the subsidies. While some have suggested that states could create a “virtual” exchange on paper and simply contract with the federal government to run it, [Nicholas] Bagley says the law on the subject is pretty explicit. “States would have to do more than just the bare minimum,” he said. We say it’s odd because that’s the same Nicholas Bagley who wrote an entire blog post (which we also cite above) suggesting, well, that states could create a “virtual” exchange and contract with the federal government. We think what the writer is trying to say is that legally it’s more complicated than states passing laws saying “We have an exchange”– the exchange has to be a real entity that can enter into contracts and whatnot. But at the end of the day it can still just contract with the federal government to do the actual work– not much would have to change on the ground. UPDATE 12/11/14: Bagley has co-written an op-ed for The New England Journal of Medicine pointing to some of the operational and political challenges to states setting up their own exchanges, and Margot Sanger-Katz at The New York Times Upshot blog makes similar points that are worth reading. As far as the operational challenges go, neither article says that states would not be able to contract with the federal marketplace performing most, if not all, of the exchange’s functions (Bagley’s op-ed simply says its not clear). 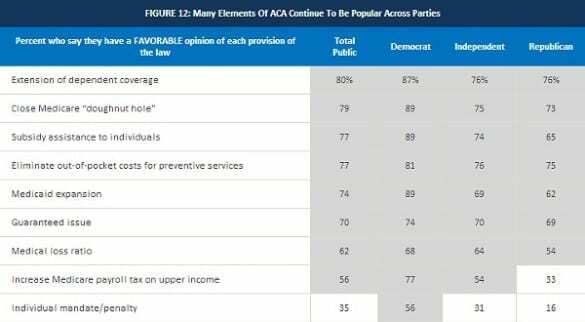 The Affordable Care Act is so unpopular in some of these states that they have passed legislation explicitly barring the governor from establishing an exchange. And only eight states’ legislatures will even be in session in June when the court is expected to rule. On the other hand, as we mention above there would be a lot of political pressure on state legislatures to approve a fix. Still, Bagley and Sanger-Katz are right that some states would almost certainly opt out, at least initially, creating a huge mess for enrollees, insurers, and healthcare providers. Next post: Republicans are suing the President over Obamacare– but is it a case they actually want to win?